Kanakavatsa (Skt. ; Tib. གསེར་གྱི་བེའུ་, Sergyi Be'u; Wyl. 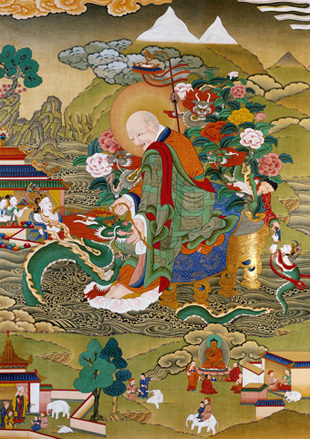 gser gyi be’u) — one of the Sixteen Arhats. Kanakavatsa was born to wealthy parents, and simultaneously, one of his father's elephants gave birth to a calf that produced gold. As he grew up, he and the elephant calf were constant companions. The king commanded that he give the elephant to him, which Kanakavatsa willingly did. However the elephant always came back to him. Realizing that such wealth only created discord, he sought ordination from the Buddha and joined the Sangha, eventually becoming an arhat. Kanakavatsa dwells in Kashmir on the Saffron Hill with 500 arhats. He holds a chain of precious stones given to him by the nagas which endow great memory, self-confidence and wisdom. Those devoted to him will never be separated from their teachers and will be respected by all. This page was last edited on 12 December 2016, at 12:13.